Happy Merdeka Day to all Malaysians here and abroad. Today marks our 55th year of independence from British colonial rule. 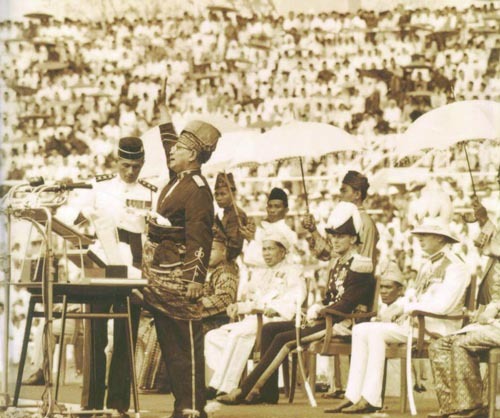 My feelings about Merdeka Day and its associations run the gamut, from apathy to optimism. As a child, Merdeka Day meant 'yay-it's a holiday-no school-so yippeeyay'. As a student abroad, Merdeka Day was just another day in the calendar marked in the Overseas Students' Union (if we bothered to look). Now back in Malaysia after living abroad for some years, it reminds me that I live in a wonderful country. Wonderful, yes. Perfect, no. I am thankful that I still have kind, muhibah neighbours (the type who still share goodies during Hari Raya and Deepavali and keep an eye on the house when we are away). I am thankful that we do not suffer from earthquakes or typhoons, apart from the occasional banjir (flooding). I am thankful that the colourful rojak of Malaysians give us diversity in food, language and culture (how many of us are multi-lingual and multi-dialect?) And most of all I am thankful that we are unscarred by war, and we live in a peaceful country (apart from the occasional Bersih demonstrations and politicians who suffer from foot-in-mouth disease). Malaysia isn't perfect, but it's where I live and I'm proud to be a Malaysian. Putting aside the ridiculous politicking and politically-motivated Merdeka themes this year, I thought I will celebrate Merdeka Day with something quintessentially and ubiquitously Malaysian. Loved by all Malaysians - anytime, anywhere. I give you...... Teh tarik. Anywhere you go, you'll find Malaysians bonding over a good cup of teh tarik and roti canai. Teh tarik (literally pulled tea) is a hot, sweet milky tea. What differentiates it from other teas is the acrobatics that it goes through before serving. 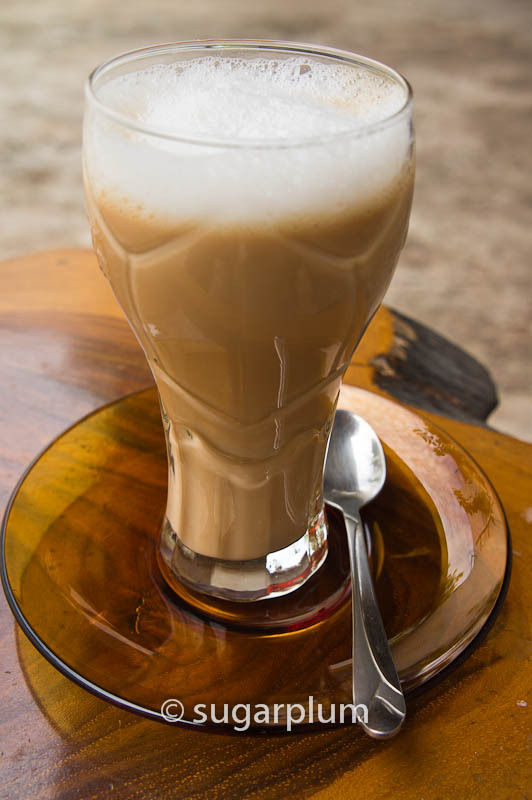 It is stretched and pulled from cup to cup to create the froth and if the mamak senses an appreciative audience, the tea will be pulled to greater and greater heights. The tarik or pulling also helps to cool the drink to an acceptable drinking temperature. Hey, I live in the tropics so drinking super-hot tea isn't going to make me go "ahhhh...". Traditionally, teh tarik is made from tea and sweetened with lashings of sugar and condensed milk. Personally I think this is a sugar-laden recipe to diabetes, but hey, what's a little living dangerously? 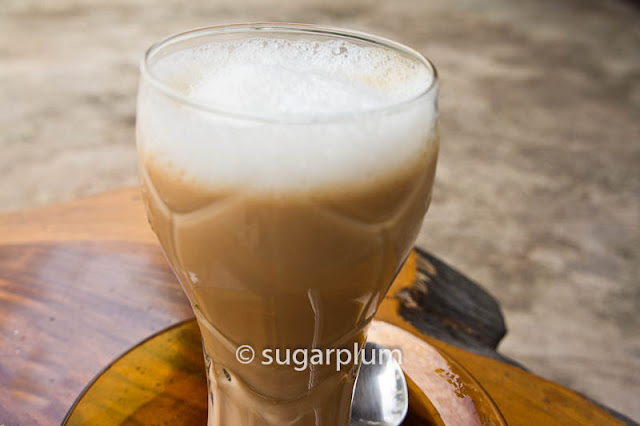 There is a variation known as teh susu lembu (cow's milk tea). This is a little healthier in that it uses fresh milk instead of condensed, and sugar is to taste. It is less creamy than the condensed milk version, but I prefer this. 1. Hold a container in your left hand. With the hot milk in another container in your right hand, pour the milk in a stream into the empty container. Repeat a few times until you get frothy bubbly milk. The higher you pour, the faster you get froth. 2. Once it is frothy, pour it into your mug and top with the tea. Add sugar to taste.